Niloufer's Kitchen: What is Parsi Food? TheArt of Parsi Cooking – reviving an ancient cuisine. Originating from what was once the Persian Empire, Parsis are the followers of Prophet Zarathushtra, born in Airyana Vaeja in the foothills of the mountains in Central Asia. Revealed over 3,500 years ago, Zoroastrianism was one of the first monotheistic religions known to mankind. In spite of it being so old, it is a living religion for just under 200,000 Parsis (Indo-Iranian) who have now settled and practice their faith around the world. The term Parsi, meaning from Pars (Iran) refers to those Zoroastrians who fled Persia and migrated to India between the 8th and 10th century. They landed on the shores of Sanjan, Gujarat where they were accepted on the strict condition of no conversion, and hence began a new chapter for themselves. 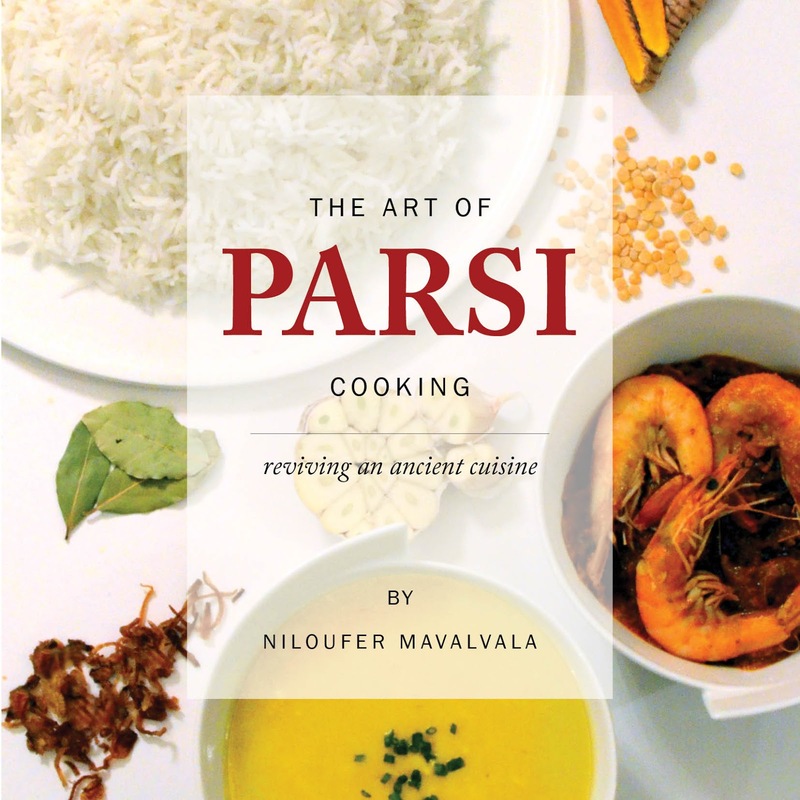 Parsi cooking was to be shaped by history. Culled from two ancient cultures – Persia, from where we hail, and India, where we then settled – this unusual historical background gives Parsi foods a distinct and unique flavour. Recipes with dry nuts and fruits giving Shirini (sweet) flavours come from Persia, while those made with ginger, garlic, chillies and spices are Indian influenced. Centuries-old ingredients like saffron, jaggery, cider vinegar, ginger, cinnamon and turmeric, all part-and-parcel of Parsi cooking, have been revealed for their great health benefits. There is much excitement to revive this ancient and unique Manna and carry forward traditions in the years to come! Meat and eggs are two favourites of Parsi food; and garlic, ginger, onion, and tomato make up the base of most recipes. While a range of spices, including, cinnamon, turmeric, cumin, and chillies create the flavour, adding jaggery and vinegar gives a finishing touch. Tikhu-Khatu-Mithu (Spicy-Sour-Sweet) is considered the Holy Trinity of Parsi cooking, and perfecting its balance is the key between mediocrity and perfection in any Parsi dish. A few of the quintessential names associated with the Parsi cookery repertoire are: Dhansak - a much-loved lentil and meat dish, “the king” of all foods Parsi. Add the Akuri and “Parsi omelette” to the various assorted “Per edu” (as in topped with an egg) dishes; this could be any vegetable like okra, potatoes, coriander, tomatoes, spinach etc. And of course a true Parsi never forgets about his dessert trolley. A dessert is a definite ‘must’ for Parsis. The delicious array of Parsi desserts, many of which are prepared with almonds and other nuts, are often enhanced with rosewater, cardamom, nutmeg, and sometimes a hint of vanilla. The grandeur of the Lagan nu Custard (a custard pudding included in a wedding feast), the duo of Sev and Mithu Dahi (sweet vermicelli and home-made yogurt), and Malido (a rich semolina-based dessert originally made by priests’ wives) are all irreplaceable old-time favorites. The various taffy-like sweets called “Pak” prepared by our grandmothers have taken on a sudden interest and are being revived with gusto. These include the Khopra pak (coconut), Badam pak (almond) and Eda pak (egg). Vesanu, with seeds, nuts, ginger, and other spices, is often given to lactating mothers to renew their strength and energy after having given birth. Mango ice-cream and Kulfi ice-cream (made with rich evaporated milk) are an adopted part of the cuisine. Amusingly, the French caramel custard has long been considered a part of Parsi food. I grew up in a family where we had caramel custard prepared every day until my father passed away. His seven brothers and sisters not only knew how to prepare it, but each insisted that he or she made the perfect one! Teatime treats to dunk into a strong cup of tea are also essential. Included in this cookbook are Batasa, a savoury butter biscuit; Nankhatai, a sweet baked semolina biscuit; Kumas, a traditional saffron and yoghurt cake topped with almonds and pistachios; and, Chaapat, a coconut milk pancake with all the traditional Parsi flavours. Other delicious sweet-snacks include Daar ni Pori, a sweet lentil-filled piecrust; Khajoor ni Ghari, dates and almonds in a semolina crust; Khaman na Ladoo, sweet coconut balls; and Bhakra, a deep-fried semolina and saffron treat. Pickles and achars are the sidekick to most Parsi meals. Gharab nu Achar, fish roe cooked in spices; Gajar Mewa nu Achar, carrot and dried fruit; and Buffena, whole ripe mangoes stewed and cooked in spices are just a few of my favourites. Emphasis on seasonal foods for health and healing is an essential part of this ancient cuisine. It is commonplace for Parsi families to have home remedies, like turmeric with honey for infections, or preparing tea with fresh ginger, cinnamon and whole spices for a bad cold. Recipes are not to be used as perfect, exact tools, but rather as guidelines resting in our kitchens to be balanced and steered toward our taste buds. The spice, the salt, the sweet and the sour in our dishes can be fine-tuned and perfectly set-up for our family and friends only through our personal kitchens. The love and affection with which a dish is made makes it even more perfect.